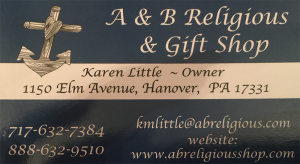 Roots for Boots is Honored to Name A & B Religious Gift Shop in Hanover, PA as Our First Featured Friend! The owner, Karen Little, collects for Fisher House by housing a collection bin in her shop as a drop site for her customers. A Navy veteran herself, Karen understands deeply love of country and the sacrifice that comes with serving. 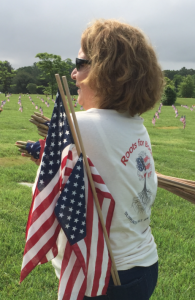 She has joined Roots for Boots to volunteer at some of our events and is a strong supporter of the veterans and military families we have assisted. She is a true patriot. Roots for Boots extends much gratitude to Karen for her service and support of us!